We’re a family. A team. A community. We went into Give Day saying those words. And you proved it true. 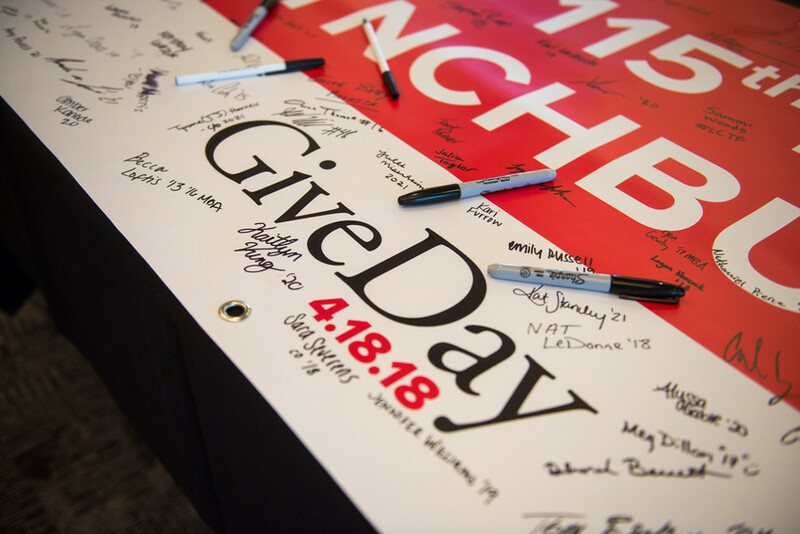 More than 1,800 donors came together to raise about $280,000 in a single day. That includes $140,000 in challenge gifts for athletics programs, unlocked with your help on Give Day. More than a third of Give Day donors were alumni. They united with students, parents, faculty, staff, and friends of Lynchburg to strengthen the Lynchburg experience for all students. Because Give Day included some offline gifts and mailed checks that haven’t been counted yet, we’ll provide more details on the results when the counting is done. Until then, thank you! Give Day 2018 was inspirational. More than 1,600 members of the Lynchburg family came together to celebrate the history and future of University of Lynchburg. That’s nearly 150 percent of our original goal ― 1,115 donors to celebrate 115 years of giving. Together, we raised over $200,000 in a single day. The students, faculty, and staff of University of Lynchburg thank everyone who made this possible. 27 Give Day Live videos, featuring interviews with students, faculty, and staff. Watch them here! Our lives were changed forever when Dr. Josephus Hopwood took his first steps on the Dell in 1903. Ever since then, our students, alumni, faculty, staff, and friends have helped our founder’s vision expand and endure. Give Day 2018 continued that tradition. Each person who played a part in the day became a founder of our future.